Blurb: Zach was once the Order of Ancients’ most feared warrior, beating back the hounds of hell to protect the unsuspecting human race. But since he left the Order ten years ago, he’s been living as a mortal . . . until now. The gates of the underworld are breaking open, and Zach is needed in the fight once again. But before he can answer his summons, there’s one person he refuses to leave behind. Shanna may think Zach has a screw loose, spouting all this “hounds of hell” nonsense, but he has to get her to safety. The journey to the Order’s headquarters is a dangerous one, and even a warrior like Zach might not be strong enough to keep the darkness at bay. 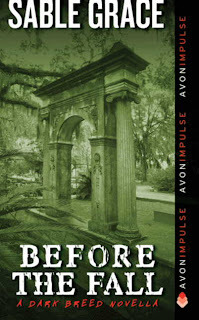 My review: Before The Fall (A Dark Breed Novella) was a quick and satisfying paranormal read. It seemed as if each chapter ended on a hook of some kind which kept me reading but did seem too smooth or gimmicky at times. Retired warrior Zach Merchant is about to head out and go drinking--his usual way of dealing with the heartbreak of being dumped by the woman he loves, Shanna--when he sees his elderly neighbor being attacked by a demon out on the street. Letting his instincts kick in, he goes back inside to retrieve his magical sword, the same he wielded as a member of the Order of the Ancients ten years earlier, before a lychen bite forced him into retirement. His sword is magically imbued and sports a design by Hephaestus which means Zach is the only one who can use it as a means of protection to the gods. Zach soon learns this attack is only the beginning of something massive and world ending. The gates of hell are splitting apart and will become fully open by midnight. By beginning each chapter with the remaining time really kept the focus on the job at hand and kept the pace at breakneck speed. The first thing Zach does is go fetch Shanna. Ironically, the reason she broke up with him was she didn't believe him when he revealed his supernatural position as a Sentinel working for Ares to her, but after he subdues her enough to leave with him, she witnesses firsthand exactly what creatures are beginning to roam the earth and what they're doing to humans (hint: meal time). I'm glad the authors made Shanna a cop and a strong one so she could attempt fighting beside the man she still loves. The action scenes were gratifying but I did wonder about the van scene with Zach driving and showing Shanna his sword at the same time unrealistic, especially since they were fleeing monsters. Still, all in all, the story was satisfying and I'm curious about the other novels in this series. Before the Fall was a quick, fun, and entertaining read. I certainly got a kick out of Zach and Shanna's interactions and enjoyed their growing close to become a couple once again. The story, though slick, did have a few sweet twists tossed in that I liked. Favorite excerpt: "She hadn't beleived him then, but after what she'd seen this morning, she wasn't so sure he was crazy anymore. Maybe she was the crazy one." Cover comment: Not a fan of this cover at all. I find it dull and boring. Having models stand in for Zach and Shanna would have been better or even his sword and fire, something else. Book source: From authors for reading and reviewing during a book tour.